Trichloroacetic peel or TCA peel is a very effective chemical peel. It is used exfoliate and renew the skin on a superficial to deep level. TCA is commonly applied to the face, neck, décolleté, hands and legs. 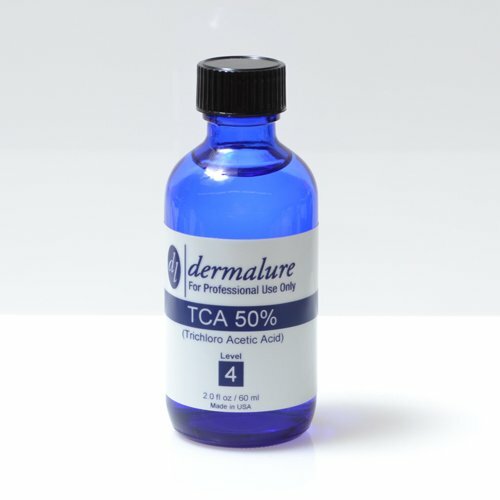 In addition, TCA is also an excellent “spot treatment” and can be used to exclusively peel isolated areas of the skin. Unlike fruit acids peels, TCA peel is a lot more effective because it goes slightly deeper into your skin. It’s a pretty popular peel in UK right now due to it’s effectiveness and the face that it can be done safely at home. There are lots of benefits to the light and medium TCA peels. The most notable is the ability to adjust the depth to fit the skin problem. As more coats are applied, the peel will get deeper, as the solution goes looking for protein to neutralize itself. The long-lasting results make it an ideal peel for those who prefer less peeling sessions at the cost of moderate downtime. Usually, 1-2 peels are enough to see results, unlike glycolic or salicylic peels where there need to be a series of 6-7 peels. During the TCA peel, your skin may become red and powdery white. It is called “frosting”. It is a sign of trichloroacetic acid reacting with proteins in your outer layer of skin. In some cases, the skin will have a temporary anesthesia or numbing effect. A day or two after the peel, your skin will start to feel tight and may turn darker. It’s totally normal. All you have to do is to apply a generous amount of moisturizer and stay away from a direct sunlight. After the 4th or 5th day, your old skin will start to come off, kind of like during a bad sunburn. It’s very important not to pull it off. Let it fall off by itself. If it really bothers you, you can cut the hanging pieces with scissors. If you skin gets too dry, you can use vaseline, however, most people are fine with typical moisturizer. The final result should be seen after about 7-9 days. All the old skin should be gone and newer younger skin should be reveled. The skin will be sensitive to sunlight, so try to stay from the beach and wear sunscreen when you go out (even on cloudy days). After TCA peel, you should notice improved skin tone, texture and clarity. Also, there should be a marked reduction of acne, clogged pores, scars, wrinkles and fine lines. After a few more peels, you might experience an increase in collagen and elastin production. Trichloroacetic peel is pretty safe for most skin types. Ideally, it is best suited for people with oily and sun damaged skin. Which TCA concentration is the best? Well, if you don’t have a lot of photo-damage or wrinkles, than 15% is the ideal concentration. If you have more signs of aging, than you can move up to 25%-30%. However, if you have never had a chemical peel before, it is best to start with lower concentration peel just to be on a safe side. There is also a deep TCA peel. It uses 50% trichloroacetic acid. While it is possible to do this peel at home, I would not recommend it. This much TCA would removed most of the upper layer of your skin. You would need some a lot of time off, probably around two weeks. So, if you go that route, do it at you own risk.